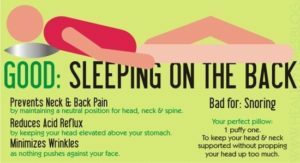 Is How You Sleep Causing Your Back or Neck Pain? Is Your Sleep Causing Your Back or Neck Pain? I get asked this question quite often from my patients with back or neck pain, so I thought I would address it to the masses. It seems most people sleep on one side or the other, followed by a smaller group who sleep on their back, then by the smallest group who tend to sleep on their stomach. At least, that’s what I have experienced with my group of patients. So which sleeping position is correct? Well, I think that all depends on each individual person and his/her needs. The best overall sleeping position is sleeping on the back. It helps prevent neck and back pain because the head is in a neutral position. Now, this could be dependent on the type and size of pillow you choose. A pillow that is too thick may cause excessive neck flexion (forward bending) which may be uncomfortable. The same idea goes for a pillow that is too thin. It can cause excessive neck extension (backward bending). Sleeping on your back with a good, neutral pillow can help reduce acid reflux symptoms by keeping the head elevated above the level of the stomach so stomach acid cannot go back up the esophagus. The only drawback to sleeping on your back is if you snore! When lying on your back, your tongue and soft palate relax and fall to the back of your throat creating a vibrating sound…SNORING! Sleeping on your side is considered an acceptable sleeping position…if done correctly! It can help reduce snoring by keeping the tongue and soft palate engaged which keeps it from falling to the back of your throat creating the vibration. 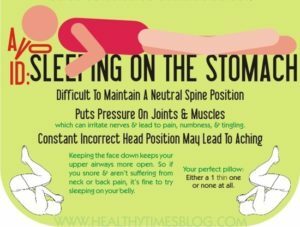 This position can also help reduce acid reflux if your pillow is thick enough to keep your head above the level of your stomach. A lot of pregnant women find this position the most comfortable as it absorbs a lot of the weight of the growing belly. If you are pregnant and sleeping on your side, be sure to do so on your left side to avoid constricting blood flow in the abdomen. I highly recommend putting a pillow between your knees when sleeping in this position in order to keep the pelvis as neutral as possible. Without a pillow between the knees, the top leg tends to drop to the bed creating a stretching of the low back and pelvis which can aggravate the low back. 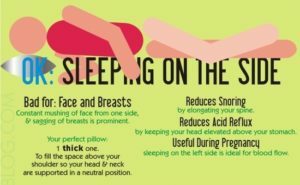 While sleeping on the side can be good, sleeping in the fetal position is not good. The fetal position causes over-arching of the spine which can restrict movement of the diaphragm and reduce breathing quality. Fetal position can also increase arthritis pain because the knees are bent for long periods of time causing stiffness and decreased mobility. 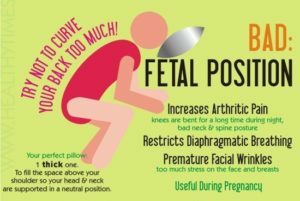 A good way to combat negative effects of the fetal position is to tuck a pillow between your knees and wrap your arms around it thus causing your spine to flatten out. The one sleeping position to AVOID at all costs is sleeping on your stomach! This posture causes hyperextension of the spine, especially in the low back. Many people with back pain have an increased curvature of the lumbar spine (low back) which puts added pressure on the joints and discs, therefore sleeping in this exaggerated position for several hours a night will only make that pain worse. Also, when you sleep on your stomach, you must turn your head one way or the other which creates pressure and irritation on the joints in the neck, not to mention the muscles. The prolonged rotation of the head while sleeping in this position can aggravate an already existing neck problem or create a new one. Finding a comfortable position to sleep in can be a difficult thing for a lot of people; especially if you are already in pain. So if the position that works for you isn’t the best position listed here, that’s okay. Just understand that you are subjecting yourself to the risk of increased pain and dysfunction later. Seeing a chiropractor for consistent adjustments can help relieve the pain and pressure on the spine in the long term. Don’t hesitate to call for an appointment today.